Believe it or not, I am actually not a big fan of pie. Gooey, super sweet fruit. Bleh. There is one exception. Pumpkin pie!! I tested this pie by not only feeding it to myself (repeatedly… for testing purposes clearly), to my roommate who is also vegan (I have to introduce you guys to her soon! ), but also to several non-vegan folk. Everyone agreed. YUM. More. Now. Please? Pretty pretty please!? So you know how some pumpkin pies are kind of firm and have a strange wobble. This pie is not like that. If I had one word to describe this pie it would be CREAMY. So smooth and gorgeous. If I had two words I words I would say CREAMY and SPICE. Those pumpkin pie spices… I mean we are a world obsessed with them aren’t we? Pumpkin spice lattes, cupcakes, scones, cheesecake, protein balls, cocktails, the list goes on. Basically if a sweet hasn’t been pumpkin spiced, it’s way behind the times. Get with the program, seriously. If I had three words to describe this pie it would be CREAMY, SPICE, and MORE. You get the picture. What makes a good recipe even better? If it’s super duper easy. You’re in luck my friends. To make this pie I literally just toss all of the ingredients into my Blendtec blender, then pour the mixture right into my Easy Vegan Pie Crust and bake. Yes, it’s really that easy. Kinda the best. Let’s begin. 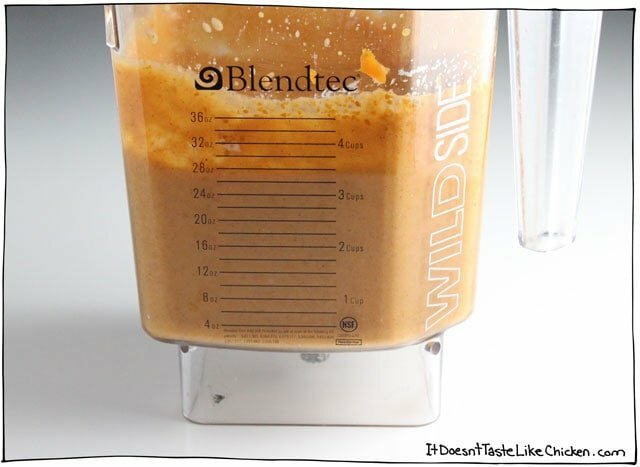 Add everything to a blender. If you don’t have a blender, add everything to a large bowl. 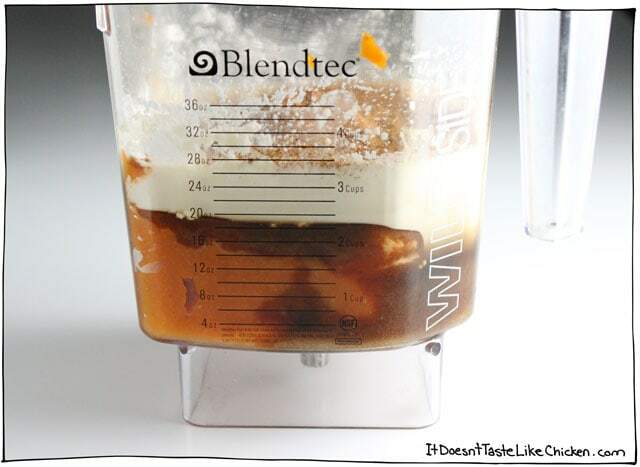 Then blend it up! Or if you are using the bowl method, whisk it up well. 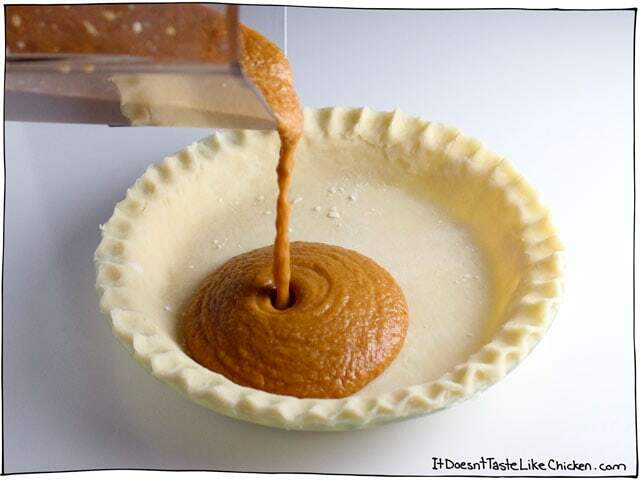 Then pour into your pie shell. Spread around evenly, then bake! Let the pie set for 4 hours in the fridge or preferably overnight. Done. Finito. All you do is add the ingredients to a blender, blend, pour into pie shell, and bake! It's perfectly creamy and full of pumpkin spice. No one will know it's vegan! Add the pumpkin, coconut milk, brown sugar, cornstarch, maple syrup, vanilla extract, pumpkin pie spice, cinnamon and salt to a blender or a large bowl. Mix well. Pour the pumpkin mixture into the uncooked 9" pie crust . Use a spatula to spread the pumpkin evenly. Bake for 60 minutes. When you remove it from the oven, the edges might be slightly cracked and the middle will still look wobbly. Let cool, and then chill in the fridge for a minimum of 4 hours or overnight until set. My Pie is currently baking but i am pretty sure it isn’t going to turn out right . I blended everything like instructed yet it looks super “soupy” . like i could have drank it. not sure what went wrong . i added another tablespoon of cornstarch …. we will see how this turns out. has this happened to anyone else ? It actually turned out pretty good. The very center was still softer than the rest but still is solid enough to cut and stay together on the plate . I think the canned pumpkin from Trader Joe’s is runnier . It’s difficult to know if something went wrong without being in the kitchen with you, the pie filling is very liquidy before cooking, so you it could be perfect. I hope it turns out for you. Firstly, thank you for the awesome recipe! It turned out wonderful. I wanted to mention that my local supermarket carries cans of coconut cream. I used coconut cream in place of the full fat coconut milk and the pie was divine. I did not have to let it set in the fridge at all, it was ready to eat after cooling a bit on the counter. It was very silky in texture and had great flavor. I will absolutely make this again! This pie is so delicious and easy to make. This Thanksgiving, I had a regular pumpkin pie, and I found I didn’t enjoy it as much as this pie. Yay! I made this pie for my boyfriend’s family when I went to visit them, his dad talked about it everyday for a week after that. I MADE IT LADY YEAR FOR MY BEST VEGAN FRIENDS BUT EVERYONE LOVED THE PIE SO NOW I HAVE TO MAKE SIX PIES FOR POP EOPLE TO TAKE HOME CAN I FREEZE, OR NO LET ME KNOW ASAP. I HAVE TO MAKE FOR THIS WEEKEND. Just wanted to chime in to say that I made this pie for Thanksgiving and got rave reviews all-around, from omnis, as well as my vegan husband. I made it in a pre-baked Biscoff cookie crust that I made (just to jazz it up a bit). It was delicious. Thanks for sharing. Favorite pumpkin pie recipe ever! Still enjoying leftovers from our Thanksgiving and planning on whipping up another one as soon as it’s gone. Thanks so much for the consistently delicious recipes! Let me just say, I am so excited that I found your site and all of your wonderful recipes; I have been browsing your site and have discovered many dishes that I am going to try! I made your pumpkin pie for this Thanksgiving and it was awesome! I thought that the coconut milk might make it taste like coconut, but it didn’t and it was sooo good! Thank you for all your hard work testing out all these recipes! And thank you for sharing them! Just found this recipe for Thanksgiving this year and I have to say bravo!! It’s literally the best pumpkin pie I’ve ever had or made, vegan or not (hubby agreed), and I made it crustless AND forgot to add the vanilla! Thanks so much for helping us have a lovely vegan Thanksgiving. I tried 3 other recipes from websites I’ve had great success with before and was disappointed so I didn’t have very high hopes for this last test before Thanksgiving, but this is a real WINNER! It might be the best pumpkin pie I’ve ever had. The texture is firm, not mushy or pudding like at all. The flavor is rich and delicious. I put my own spice blend instead of using pumpkin pie spice, but that’s the only change I made. This is PERFECT and will be my go to pumpkin pie recipe from now on. Baking has been the hardest part of transitioning to a vegan lifestyle and I’m not new to it, but finding good versions of recipes that traditionally have a lot of eggs is hard. Thank you so much! Hi! I made your pie for Thanksgiving yesterday and my husband said it was the best pumpkin pie he ever ate; and he’s eaten a lot over the years! Thank you for such an easy, delicious recipe!!! Thi recipe is amazing! Made a “test pie” before Thanksgiving and used my coworkers for taste testing. “The best I’ve ever had,” one said. She was right! Can’t wait to try your pumpkin cheesecake recipe too! Haha! That’s awesome!! I love when vegan food wins! I baked the pie and followed the instructions to a T. The pie came out very dark, close to being burnt, yet the inside is still a little moist. I checked the pie with 20 minutes left on the timer and it was dark then so I stuck a knife in it to see if it was done. The knife came out very wet so I left the pie in for the full 60 minutes. It is so dark that I cannot take it to the family gathering. Where did I go wrong? The knife test will not work on this pie as it will be wet the whole time. Do you mean that the filling was dark, or that the pie got burnt? If the filling is dark, that happens just with different pumpkins, they can range hugely in colour. If the pie is burnt than it sounds like your oven is too hot, which is a common problem with many ovens, and I would recommend getting an oven thermometer. Hello. A quick question. Can I use ready crust pie crust? I’m sure it should work just fine. Hi. I made this Sunday afternoon,. I am not a fan of pumpkin pie but he is so my expectations were not very high. All I can say is WOW. This pie is fantastic and I am now a pumpkin pie fan. He enjoyed it as well. Thank you for sharing your recipes with ue. THIS IS MY FAVORITE PUMPKIN PIE EVER! the ingredients are simple and everything comes together so nicely. Last year I made it for my family and it was a hit. This year I’m making two so I can share with my boyfriends family. OK with your recommendation, I’m making it for Thanksgiving Thursday 2018 for a group of skeptical carnivores and one lactose intolerant guest. I’ve been getting good-natured taunting about my meatless diet, so I need at least a slam dunk for the dessert. This is it! My parents and my best friend loved it. They aren’t vegan or vegetarian and said it was amazing. For sure try it and wow them!! I can’t wait to make this pie! I was wondering if it is okay to store on the counter or if it is supposed to be refrigerated? We will be travelling for Thanksgiving so wondering if I will be able to make this beforehand. If you read the whole recipe you will see that the pie needs to be cooled and then sets up in the fridge overnight. So fridge it is! Yes. One 14oz can of pumpkin is about 1 3/4 cup. I only answered because I had to test it myself! Yes, the same amounts, just in different ways of measuring for peoples convenience. Made a trial pie last week and my husband loved it! I used a premise crust last time, but want to make the crust this time around. Can I use butter instead of shortening? If so, is it the same measurement? So happy you enjoyed it! I recommend the shortening for the best results. Vegan butter melts easier and can make the crust less flakey and more difficult to work with. But if you do substitute it would be the same amount. Enjoy! I commented & rated this a couple years ago… I’m making it AGAIN! Annnd I’m going to be sharing with more people! -Can this be frozen before it’s baked? I was thinking of making the pies ahead of time (I was thinking a day or two in the freezer). -A housemate of mine put my can of Pumpkin the fridge and it’s been in there for some time. I don’t dare to put it back in the cupboard. I’m not sure if doing that would ruin it or if it would affect this recipe differently than it might a another one. I found out that I have to completely keep away from gluten. This time I will be using pre-made certified vegan and gluten-free pie shells (that happen to be Non-GMO Verified as well). They’re the Wholly Gluten Free kind by Wholly Wholesome and they’re baked in a dedicated GF facility. I’ll reply again with my results in case anyone is looking for a gluten-free option to try. So happy you enjoy it, Christie! You can freeze the finished baked pies, here are some directions on how to do that. As long as the can of pumpkin isn’t open it’s totally good to go, whether you want to put it back in the cupboard or bake with it. Cans are shelf stable until opened. Can you use evaporated coconut milk instead? Thanks. I haven’t tried it myself, but it might be a bit too high in fat for this recipe, but it could work fine. I would always recommend sticking to the recipe as closely as possible for the best results if you can. Enjoy! The coconut milk is very rich and creamy which is what helps make this recipe awesome. Soy might work ok, but it won’t have the same richness. I’m coming up with ideas for a pie to make around Christmas that will be both gluten free and vegan. I’m gluten free and I have a cousin who is vegan. I’d found a recipe elsewhere for Apple butter pie, which calls for eggs to thicken. Even if I decided not to take my cousin’s moral dietary decision into account, I still dislike using eggs to achieve a custard consistency. Your pumpkin pie recipe looks so easy anyway; I’ll just sub in Apple butter for the pumpkin puree, and decide what to do about spices and sweeteners, and pour the filling into a gluten free vegan pie crust. I just reqlized instead of 3/4 cup, I accidentally added a whole can of coconut milk‍♀️ The pie is already in the oven. I’m not sure if it will set up with all that extra liquid and it will probably end up being pumpkin pudding instead of pumpkin pie, lol. The mixture tasted awesome though, so I’ll definately be making again with the correct amount of coconut milk. Oh yes, it probably won’t set very well with the extra liquid. Hopefully, you can still enjoy it more as a pudding tho! Glad you enjoyed! Yes, the cornstarch helps thicken while keeping it creamy. I don’t think flax would work the same way but you’re welcome to experiment. Can tapioca starch be used instead? No, tapioca tends to break down if subject to heat for too long so I imagine it wouldn’t work here. I tried it today with my own pumpkin that I drained for a day. It was thick when I put it in the oven. But it never firmed up, actually it was even runnier after cooking it 2 hours instead of one. I a, used to make no it with eggs and carnation but here in this recipe, it is too sweet as well Even though I both reduced a bit the sugar and syrup. Made this a couple of weeks ago with the idea that I would try making various pumpkin pie recipes to see which was good enough to make again for the family holiday. I made this one and we decided it won without even trying others. 😀 My hubby was disappointed we wouldn’t be making more pies before then though. Has anyone tried it with graham cracker crust? Mine is in the oven now! By the way, in the US, I saw an article for swapping 3/4 cup of non-dairy milk with 1/4 cup any oil as a coconut milk substitute. We will see how it turns out! I completely forgot that I needed to let the pie set in the fridge! I don’t have much time. Anything I can do to help it solidify faster? Can I put it in the freezer for less time after its baked? Or add any ingredients? I’m guessing it’s too late now, but no, I would recommend letting it cool in the fridge until set for at least a couple hours. I absolutely love pumpkin pie and used to eat my grandmas at thanksgiving every year, they were amazing. I am so happy you made this recipe because now I can have pumpkin pie again and it is just as good as my grandmas! I topped mine with Cocowhip one time and Redi-whip almond milk the next time. Amazing!! So here’s the thing right, I tried cooking in on the stove but it burnt and it’s stuck to the pan, do I just put it in the microwave and hope that it will cook and come off? Also, I cooked the pie in the pumpkin because I don’t have those little thingies where you actually put the crust and the pie. Sorry to hear that loris, I myself made that same mistake twice. I think you should try greasing the pan before putting the pumpkin and if that doesn’t work you could always just grill it outside. Pies shouldn’t be cooked on the stove, they definitely have to be baked in the oven! Better luck next time. I’m living in France and there’s no canned pumpkin puree over here. Can I use fresh pumpkin? Or should I just cook it fora couple of minutes before using? You can make your own pumpkin puree. There are many recipes on the internet so just find one that suits you. Once you have the puree you can go from there. Enjoy! thanks, I know now 🙂 and I made the Pumpkin Pie 2 time, one for a vegan dinner here in the area. there was nothing left, it’s just delicious!!! I used this recipe every time I want pumpkin pie! Even out of season. I’ve introduced this pie to my whole family and even non-vegans love it. Thanks for the recipe! I’ve made this a few times and it’s so good. FYI for anyone wondering about substitutes for corn starch: I tried it once with tapioca flour and it turned out like jelly and had a weird taste to it. Not recommended. Then I tried it again with 1/2 cup flour and it worked perfectly. Didn’t affect the flavor and gave it a nice thick but creamy consistency. Thanks for the recipe! So happy you enjoyed it so much Sophie! Hi Sam! So, I made this pumpkin pie last night and I gotta say it is absolutely de-li-cious! Your recipes never disapoint! So I told my boyfriend about this amazing vegan pumpkin pie and he happens to be out of town for about a week and now he is sad so I suppose I should save him a piece right? I was wondering, how long this pie stays good in the fridge or do you think it’s a bad idea to freeze it? Hi Jessica, I would say it should stay fresh for 5-6 days in the fridge. I have never tried freezing it myself, but I have heard other people have done it with success. Enjoy! This pie and your pie crust are amazing!!!! So excited to be in Canada for Thanksgiving this year and will be cooking so many items from your cookbook for non-vegans-shhhhhh they will never know they are vegan and I know they will love them all! Looking for to next Monday!!!! So thrilled you enjoy it, Betsy! Ah I wish I had that luxury of not telling anyone. I just have to be in the room and everyone already knows. Haha! Sorry for that but it is a terrible receipe. Tasteless crust but filling full of sugar. Where is a balance? I made it yesterday and – to be honest – I think I’ll throw it away. Ive made this pie a few times for many family members and your pie crust recipe about a half a dozen times now. Just found both recipes about a month ago haha. I just made it but subbed fresh baked sweet potato instead of pumpkin. I only ever get compliments on how good it is even from people who normally dont care for pumpkin pie! making my 15th I.D.T.L.C pumpkin pie of the season and my family has to be restrained!!! This pie is super delicious and the non vegan guests we have are in love with it too. So called regular pumpkin pie is often laden with sweetened condensed milk, so using maple syrup and raw brown sugar is a trade off I am happy to make….it is called pie after all. This sounds really yummy but 21g of sugar is a lot for one slice; do you have any recommendations for cutting the sugar? Any help would be appreciated. My blog isn’t focused on health foods. You can substitute with whatever you want but I’m not sure of the results as I haven’t tried an alternative. This is an amazing pumpkin pie recipe. Thank you! I have a son with an egg allergy and so I always make two different kinds of pumpkin pie (one with egg and one w/o). The one with egg we’ve been doing for years and love, but I’m trying to find an eggless one that was as good. YOUR PIE WAS BETTER! It would be amazing just to make one kind from one on. Thank you! This pumpkin pie is soooo good it tastes exactly like regular pumpkin pie. I made it for a dinner one time and the guests were so surprised it was vegan. I made the crust too by your recipe and it came out perfect!! Thank you so much I will be making this pie every year!! I made this again today. I love it so much. However, I use SILK soy creamer instead of the coconut milk because I want the pumpkin to shine and not taste any coconut. Great recipe! Very easy! So happy you enjoyed, Tara! Sooooooo amazing!!! My search for the best vegan pumpkin pie recipe is over! Yay!! So happy you love it!! I haven’t seen this question asked yet. Are you referring to pumpkin puree, where you reference pumpkin pie filling? Because I have seen all three forms in the store: canned pumpkin, pumpkin puree, and pumpkin pie filling. I only use organic pumpkin puree, and I’m not too sure about attempting the recipe without knowing it will work, if it’s not the same consistency as the canned pumpkin. Thanks! Canned pumpkin or pumpkin puree (the ingredients should only be pumpkin). When I am referring to the pumpkin pie filling I am referring to the one we are making using canned pumpkin. Enjoy! This pumpkin pie was everything! I followed the recipe exactly and it was firm, thick and creamy. My husband said it “brings back and memories” and my Omni 5 year old nephew whose favourite dessert ever is pumpkin pie gave it a 10/10. He didn’t detect the coconut at all (even with the cocowhip). I am not big on pumpkin pie but this was delicious. What’s your go-to full fat coconut milk brand (I’m also in the GTA)? Had a couple of fails in other recipes (got one that was the extract variety, got a proper full fat one (Cha brand I think) to make whipped cream but it would not whip was just super chunky). Want to make this pie on the weekend as a special request from my 5 year old nephew, but want to get optimal coconut milk! Thanks in advance. For coconut whipped cream I love T & T brand. For general cooking I use Grace. Enjoy! My pie is in the oven, so no slice yet, but the batter was divine! later after it has cooled, and I have devour a slice! Cheers. Criminy – AND, I didn’t have brown sugar so I used granulated cane sugar. Okay, I think I’m through here…. still bats 1000 in my books! Pudding, Gooooood; Sand in your bathing suit, Baaaaad. I make this with Silk Nog instead of coconut milk and it’s absolutely perfect. Thanks for the best vegan pumpkin pie ever! Thin as yours looked in the picture, and also as many commented their pie mix was very thin. I baked it in the time allotted And noticed after I put it out to sit that the pie has pulled away from the crust a bit. Also was not jiggley in the center as many commented. I can’t figure out why this happened. I used Libbys canned pumpkin and Trader Joe’s coconut milk – canned. It is cooling so I will not know how it tastes until tomorrow. Hoping for the best! My first vegan pie so a little nervous about it. Also pre-baking for Christmas to see how it turns out. It should be a thick smoothie consistency, but if you followed the directions exactly it should work just fine. I hope it turned out for you! I know I’m a bit late to the party but I was just wondering if you can taste the coconut from the milk as I really don’t want it to be an overwhelming flavour? Thanks so much! Delicious!! Made the filling as directed but put them in store bought tart shells to take to the office. Bake time was 15 to 20 minutes. I preferred the batch where I had pre-cooked the tart shells. Makes at least 30 tarts with filling left over. Great recipe thanks! Thrilled you loved it so much, Ellen! Can I uses regular coconut milk from a carton or do you recomend from the can only? Thanks! Canned only. The stuff in a carton has been thinned for drinking. The canned stuff is high in fat and makes for a creamy pumpkin pie. Enjoy! Love this recipe and have made it twice already, but was wondering if tapioca starch or arrowroot powder might substitute for the cornstarch successfully. Could you comment on that? Thanks! Hi Wanda, I haven’t tried it with either. I imagine arrowroot starch might work, but I wouldn’t recommend tapioca starch as it tends to make thing gooey such as in my vegan cheese recipes. Hope that helps! Hi! I’m excited to try this recipe but I wondered if I could just use almond milk instead of coconut milk!? Do you think it will affect it at all? Hi Bry, I use full-fat coconut milk (the kind in a can) because it is incredibly rich and creamy. Almond milk won’t provide the same richness, so I recommend sticking to coconut milk if possible. Enjoy! Hey ! Love your blog & yt ! Quick question I’m hoping you’ll see this before tomorrow. I tried to make this and everything’s good except the middle is still not firming up, any suggestions ? Did you let it set in the fridge overnight? If you did and it is still wiggly, it sounds like your pie is a bit undercooked. Next time bake it a bit longer. Hope that helps! The taste of this pie was delicious! I used a premade Marie Callender pie crust and followed the recipe except I didn’t have cornstarch and tried tapioca starch instead. I searched what ratio to replace the cornstarch with tapioca starch and although there were many opinions, I decided to try 1:1. I do not recommend that! It was quite gelatinous. Next time I will try 1/8 cup (2 tbsp) instead of 1/4 cup or will just use cornstarch. The taste was excellent though and the Marie Callender crust worked very well. I will make this again for Christmas! Thanks Sam for the yummy vegan recipe! Thank you for this recipe. As a new plant based eater and wanting pumpkin pie this was absolutely wonderful. Made this pie for Canadian Thanksgiving. It was fantastic. Searching your other recipes and will be making the chocolate cake for a birthday and the tortilla soup next. I have to say you have the best vegan recipes I have been cooking and baking a long time but only vegan for one year. Looking forward to trying a number of your recipes in the coming months. This recipe is flawless! The best pumpkin pie I’ve ever had! (Even before going vegan) The best part is that is really is SO easy. I didn’t even use a blender I just whisked it all together and put it in a premade vegan pie crust and wa-la! The only change I made was let it cook a little longer (approx 10-15 min) but oven times may vary. Perfection when served with vegan coconut whip cream! Thank you, thank you. My go to recipe from here on out. Made this recipe exactly as the directions and it is the best pumpkin pie I’ve ever had! My kids loved it too! My son has an allergy to eggs and dairy so this pumpkin pie recipe saved our Thanksgiving. Can’t wait to have for breakfast. The only pumpkin pie I’ve ever had that doesn’t need copious amounts of whipped cream! Not sure if anyone is going to see this in time….I made this in the past and loved it. I just put my Thanksgiving pie in the oven when I realized I mismeasured the coconut milk. I think I only added 1/2 cup, not 3/4 cup. Will this work out in any way? I assume I would have to cook less time. I may not know for sure if if it is edible, until we actually try to eat it. I have enough stuff to make a second one as a back up. Should I do it? Hi Jen! I haven’t tried that myself but I imagine it will be fine, just a little firmer. Enjoy! Just to update the pie was fine. A little firmer, as you mentioned, and it didn’t fill the pie shell as well. I cut the cooking time a bit. It was yummy and everyone who ate it enjoyed it, even my husband who doesn’t like vegan substitutes. Thanks for the great recipe! Yep! It’s very liquidy, I pour mine out of the blender. It needs to bake and set to become solid. Enjoy! Hey! 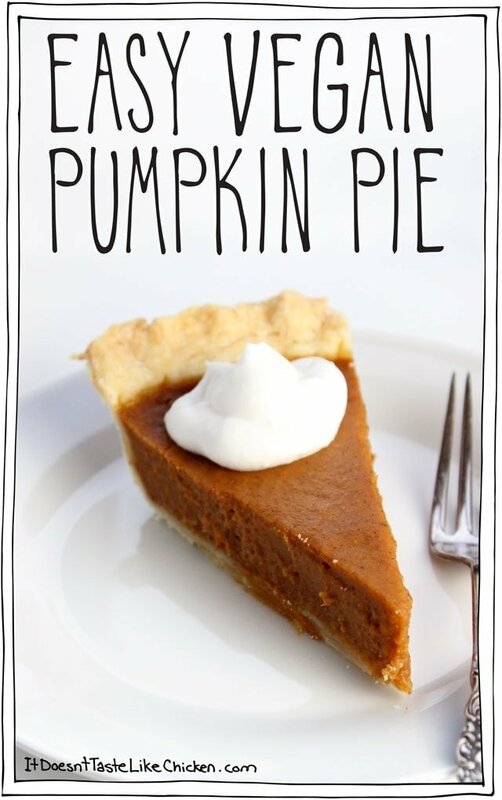 I want to try out this pie, but canned pumpkin isn’t really a thing where I live, so I’m wondering how would this recepie work with a fresh pumpkin? Should I cook/bake it beforehand, add some spices? Ugh, nevermind, I remembered that I can use ctrl+f to search the comments. Will be attempting it soon! If you use fresh pumpkin, out should be a sugar pumpkin not the large Jack o lantern type. You’ll need to cook it down to be thick, fresh pumpkin is quite watery. Can the maple syrup be replaced with organic sugar? Maple syrup provides a gorgeous falvour to this pie, bit if you want to replace it use another liquid sweetener such as agave or corn syrup so the consistency stays the same. So my pie is definitely darker than yours thought it wasn’t before I baked it… It also didn’t really crack but instead like puffed up a little and on the edges near the crust it looks like it crystalized a little… like sugary and raised? I followed the recipe exactly… what do you think? Does the texture on top sound weird? Hi Ashley, I’m sure the pie will turn out just fine. Some pumpkin pies turn out darker because of different varieties and ripeness of the pumpkins. Nothing to worry about. Enjoy! Im making this recipe tonight in a larger pie pan. Any suggestions for expanding the recipe? Should I just double everything and expect to have leftovers? Thanks! Hi Betsi! It depends on how large your pie pan is. I would recommend keeping the pie sizes the same as the recipe to ensure it bakes through properly, but if you want more pie just make two pies 🙂 Hope that helps. So I just made this recipe and it smells A-MAZING. And it cooked up perfect except that it came out really dark. Like it looks like a chocolate pie. Not burnt, just brown. Have you had this happen with this recipe before and do you know what I can do different next time? Hi Bonnie! Thrilled you love it. The darkness just comes from different varieties and ripeness of pumpkin. Nothing to worry about. Next time you could try a different brand of pumpkin and I bet the colour would be different. Enjoy! If i don’t have a blender can i use my kitchen aid standing mixer?? I would recommend just mixing it in a bowl making sure to mix the cornstarch in well. Enjoy! Hi Sam! This recipe looks so good and I plan on making it. Can this be made with lower fat coconut milk or does it need to be full fat? Hi Magen, it needs to be full-fat so the pie has the correct creamy consistency and richness. Enjoy! 1. Do you think subbing coconut milk for Trader Joe’s soy creamer would work? It seems the right amount of creamy and not too sweet? 2. Could I sub cornstarch for tapioca starch or gel? 3. If I already have the spices for ‘pumpkin pie spice’, eg clove, nutmeg, cinnamon and ginger, do you suggest a ratio? I really want to try this recipe but I would like the pie to be served warm. Is there any way I can cook and chill it overnight and then warm it right before dessert? Hi Olivia, this pie is intended to serve cold, I’ve never had pumpkin pie served hot before so I am not sure how that would work out. Just put the pie in the oven! When I was mixing all of the ingredients together, the filling seemed SUPER runny. I think it might be from the coconut milk I used since it was separated, and I had to heat it up so it would combine. Will the result come out okay? I have a niece that is allergic to coconut, can I sub soy milk for the coconut milk? Yes you can. Try to opt for a higher fat soy milk so that it still has some richness. Enjoy! Wowza! There are a few vegans/vegetarians in my family so we always try to mix up what we bring for Thanksgiving. This year, I decided to make a pumpkin pie. I found your recipe & it had great reviews & seemed pretty easy breezy. I did a test pie today & I just tried a slice w/coconut whipped cream & it was AMAZING! Will definitely be making two pies for Thanksgiving 🙂 Danke schoen, Sam! Looking super forward to trying out more recipes. I’m hoping to make this ahead of time and freeze it. Would you recommend baking it, letting it set overnight and then freezing it? Thanks!! Hi Cathy, I’ve never frozen a pie before but here is how someone else did it. The pie needs to set overnight and will keep for 2-3 days so perhaps that’s far enough ahead of time without freezing it? Hope that helps! Can I use condensed coconut milk instead? No, that would make the pie to sweet and not bake properly. Wondering if I could do this baked into a gingersnap cookie crust? Have you tried it with any other crust than the flaky pastry type? Absolutely you could! I haven’t made it that way, but I’m sure it would work. Enjoy! Hi, can I use honey in place of maple syrup? Maple syrup provides gorgeous flavour so I would stick with that. Honey isn’t vegan, so I don’t cook with it or recommend it for any recipes. I made you pie for a Friendsgiving this past weekend and it was a huge hit! Very easy to make too! Hello! I’m so excited to try this recipe for my family this year. I was just wondering if it would be adaptable to make in a 9×13″ pan so I can cut into bar shapes? Hi! I am not the person who wrote this, but generally if it’s a 9 inch pie you want to double the recipe for a 9×13 (you could totally use an 8×8 though) and just be careful with bake times. 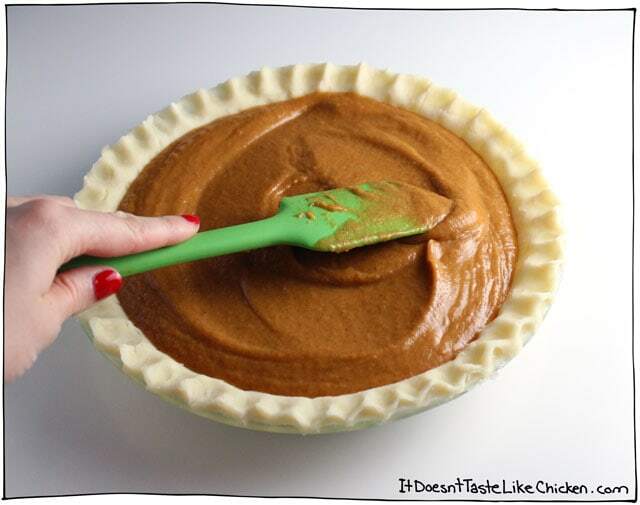 I’d also do a graham cracker crust or something similar instead of the traditional pie crust. Hi! This recipe looks fantastic! I was wondering if I would be able to sub coconut sugar for brown sugar? I did, and it turned out wonderfully! Hey! Just popped this pie in the oven! The filling on the spoon tastes delicious but I think wasn’t until after that I noticed my texture looks nothing like yours… I used fresh pumpkin purée… any idea if it will still work? It’s difficult to know without being in the kitchen with you! Hopefully, it worked. This pie is absolutely AMAZING!! It is so much better than the non-vegan pumpkin pie I made last year! Thank you so much for this recipe! I will be passing it around for sure! Had to add a comment because I made this pie for my book club as there is a momma in there who cannot eat dairy or eggs. Everyone LOVED this pie and we even liked it better than regular pumpkin pie! I served it with So Delicious whipped coconut “cool whip” (in freezer isle.) It was so delicious I’m making it for Thanksgiving for my non-vegan family. It was just that good. Thanks for the cool whip tip! Wow! My husband and I recently converted to “veganism” (not sure if that’s a word or not) . One of his favorite seasonal desserts is pumpkin pie. Im telling you… this pie is BETTER than a regular pumpkin pie. It’s fricken amazing!! Thanks for the recipe! 1. is it ok to double the filling and the curst recipe and fill the pie a bit more + use the left over crust dough+filling for mini pies. if yes, how long an what temp. should I bake those? 2. I tried to make it last weekend and the top of the pie filling was uneven after baking, sort of bubbly, any suggestions? I really want to achieve the smooth finish. I have never filled the pie more than one recipe’s worth, and I would be worried that the pie wouldn’t set properly. Instead how about doubling the recipe and making two pies? It sounds like there were some air bubbles in your pie. 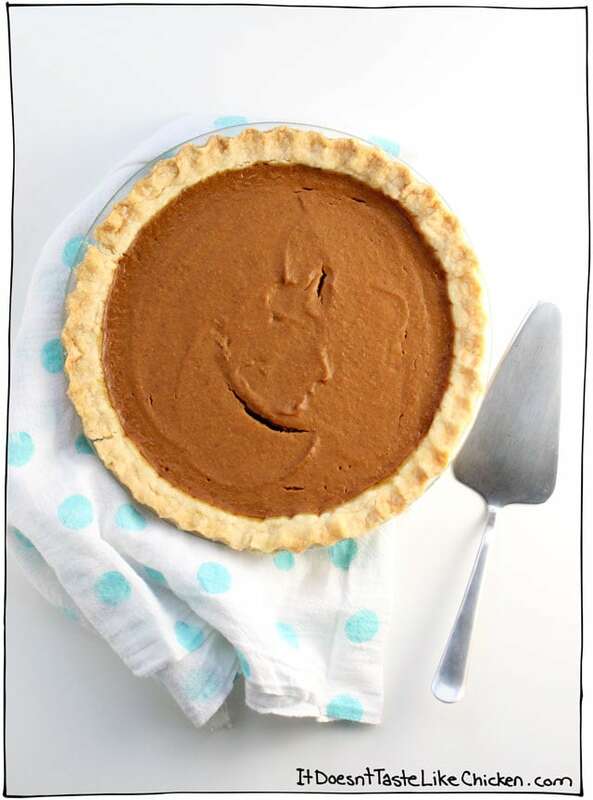 Next time when you pour the pumpkin pie filling into the crust, lightly tap the bottom of the pie on the counter several times to help release any air bubbles, then use a spatula to smooth the top as nicely as possible. I hope that helps! Hey thanks a lot. I wasn’t going to put a double amount of filling in one pie, I was thinking only to put in slightly more so it is closer to the edges, and then make some extra mini pies with the rest of the filling 🙂 do u think that could work? Mine are currently in the oven, got about 15 minutes left and I’m really worried they won’t solidify! Is it normal for them to still be wobbly after 45 minutes?? Yes absolutely. They won’t set fully until they have chilled in the fridge for several hours. Dying to try this pie… would it be possible to have the ingredients in grams ? Thank you so much !! Hi Sabine, grams is a weight measurement whereas cups and spoons are volume, so there is no quick conversion. I know a lot of my readers from the UK have simply picked up a set of measuring spoons and cups so they can easily make my recipes without converting. Hope that helps a little! Could I make this recipe without cooking it if I did a raw crust? No, this recipe needs to be cooked or it will just remain a liquid. I made this last week and it was amazing, thanks so much! Hi, just made it last night and I loved it! I’m not vegan, but I like to keep my desserts as healthy as I can… And this recipe is even better than many of the traditional ones I’ve tried. Loved the crust, too! Before i was vegan, I used to make a lot of delicious pumpkin pies and it was one of the recipes I desperately wanted a vegan version of. I tried the minimalist baker one and it was a flop, a slop actually and had a recipe that was both ingredient and instruction-wise complicated. Last weekend for thanksgiving, I received a home grown sugar pumpkin from my family and went looking for a easy vegan pumpkin pie, and here it was! I sliced the pumpkin in half, scraped out seeds and baked it, scraped again. I used a food processor to mix the ingredients and put it in the oven and it came out perfect! No wobbles, no cracks, just pulling away from the edge a tiny bit. After refrigerating over night, I couldn’t resist and sampled a tiny piece with breakfast. Amazing!!!!! I am so impressed with the flavour and texture! I am one satisfied vegan! I’m going to tell the whole world about this recipe! What happens if I add the pumpkin filling instead of an actual pumpkin? Pumpkin pie filling contains other ingredients such as sugar, spices, and setting ingredients (maybe not vegan). It’s intended to dump in a pie shell straight from the can. This pie is fantastic! I made a “trial pie” before the inlaws come over and my husband and I were blown away by how delicious and creamy this pie is. For the trial pie, I taste-tested it at varying stages of its cooling/setting. I found that it was BY far best after it had been refrigerated overnight. After just a few hours of refrigeration I could still detect the starchiness of the cornstarch, but by the next day that texture/taste was gone. I just pulled the “real” pie out of the oven for dinner tomorrow and I’m proud to serve it at my dinnertable. Hi! I made this pie yesterday as a test before Thanksgiving when all of my family comes. It was amazing but the one thing my dad mentioned was the pie was a little heavy. So today I made another two, but instead of putting everything in the blender, I used my mixer to make the coconut milk into a coconut whipped cream. Then I mixed in everything else instead of using the blender. It’s so so much lighter and its so good! I also used your pie crust recipe and it worked like a charm! So happy with this thank you. I recommend to anyone who likes a lighter pie to make the coconut whipped cream then use that. I measured out the coconut before I made it into the cream though just by the way. I just made this tonight – it’s in the oven finishing up right now! I won’t be tasting it as it’s for a friend but it looks AMAZING. I was a bit nervous with the filling at first as it was quite runny for me (I used freshly pureed pumpkin – maybe a higher water content? ), but it looks like it’s firmed up perfectly!! I also added a tablespoon of molasses and a teaspoon of cardamom and it smells/looks great! I doubled the recipe and it turned out great! I used your pastry recipe as well. My non-vegan roommate and I agree this pie is way better vegan! One pie for me to “test” and another for my family for Thanksgiving! I’m allergic to coconut..Do you know if it’s possible to use cashew milk instead, or would that mess up the consistency? Hi Gabby, I think that should work ok. I would buy the cashew milk that has the highest fat content so that it is most similar to coconut milk. Hope that helps! Thank you so much! I tried it with cashew milk and it turned out great! The middles were a bit more wobbly than if I used coconut milk, but they still tasted fabulous. I will definitely be keeping this recipe forever! I have been making pumpkin pie for years and just this year have chosen to be vegan. This pumpkin pie is 10000 times better than any pumpkin pie I’ve made or have had in the past, AND it’s vegan! You nailed the spices, texture, and the creaminess. Not only is this recipe perfect but I’ve tried many other recipes of yours this week and all of them are stunning my husband and I!!!! Thank you! Aww yay!! SO happy you loved the pumpkin pie so much, and that you are enjoying so many of my recipes, Ali! Being a new vegan, or at least mostly vegan leaning, the first thing I wanted to look up was pumpkin pie(because… Fall… Duh, and because I’m a stay at home mom that bakes something new weekly). This was the very first recipe I’ve stumbled upon…. I am SO EXCITED to try it. I’m learning that so much can be made vegan and not only look, but taste so much better if not, just the same! Thank you! I’ll be letting you know how this goes!! This was A-MAZ-ING. 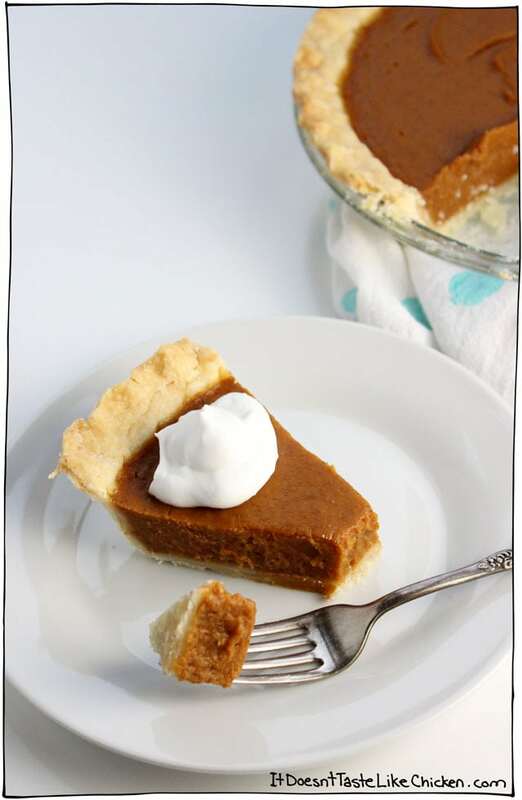 I’m new to veganism and I’m crazy about the fall season so I looked into vegan pumpkin pie, stumbled on this recipe, and tried it out. I had it in the fridge overnight since I made it very late in the evening. Had it for breakfast. Thank you for making the transistion better for me, I will continue to make this again. I just made this pie and it was delicious! So creamy. So pumpkin-y. So GOOD. Happy Pie Day! I find myself coming back to this recipe again and again, it always comes out great. When I’m feeling fancy i put a pecan crumble on the top, I highly recommend trying it out. We have been making our way through your amazing blog, and I never have to “test” recipes on here because I know they are all incredible. I found you through your holiday side dishes (that my very meat-eating family loved and had no idea were vegan, from scratch). But this pie… this pie! Is absolutely incredible. The best pumpkin pie I’ve ever had, and I’ve made my way through plenty. As other commenters have said, the texture and the flavors are just perfect. It’s well-spiced, so that each bite brings you right back in. I never get tired of it. It’s not too sweet (although, it is a dessert, so it’s sweet enough), and it leaves you wanting more. Hahahaha! Wow! This comment made my day! My recipes are always just a lot of experimentation until I get it right. So very happy you appreciate it so much, thrilled you love it! The sweet potato pie sounds fantastic! This is a really good pie recipe, but might I add a few suggestions to try? Replace the coconut milk with coconut cream. Make it a teaspoon of cinnamon and add an additional 1/2 teaspoon of allspice. You’re always welcome to adapt the flavours to your own preference. Enjoy! I’ve made my fair share of vegan pumpkin pies, but this one is BY FAR the most popular. We had it for Thanksgiving and my husband has been asking me to make another one ever since. In fact, he asked me to make it for Christmas as well. I kind of want to try a variation on it – maybe by adding a streusel topping – do you think it would cook okay if I just made the recipe as-is but added a topping to it? Thanks! That’s kind of what I was thinking but wasn’t sure if anyone else did it that way – I appreciate the link! So…love the filling in the recipe but for people who are truly vegan……what kind of crust are you using…..? I’m truly vegan so all the recipes on my blog are 100% vegan. I use my Easy Vegan Pie Crust recipe or you could buy a store-bought pie crust, many are vegan you just have to check the ingredients. First time I have ever made a pie – this was super easy and so yummy. I just had the last piece this morning – it was amazing. My son and myself ate the whole thing to ourselves. I made the pie last night and served it today at our Thanksgiving celebration (I live in Holland and we don’t have Thanksgiving, so everyone has to work on Thursdays). I used the Dutch “speculaas” spice as we don’t have pumpkin spice here and it is very similar to pumpkin spice. i never really liked pumpkin pie before so I was curious if I’d like it, the batter tasted really good! And so did the pie!! My (American) husband said that this is exactly how pumpkin pie should be! the recipe is so easy to make, also the pie crust! I used fresh pympkin, we don’t have canned pumpkin puree here. I will definitely make this pie again!!!! Thanks for the aweske recipe!! I’ve never heard of Dutch speculaas spice, but am intrigued! I will have to try it one day. So thrilled you love it so much Monique. I made to of them yesterday,one with only one teaspoon of pumpkin pie spice,both taste great but i like it less spice,great recipe,thanks. This is by far the best vegan pumpkin pie recipe I have made. Gave it to non-vegan family members for thanksgiving and everyone loved it! I used coconut cream instead of milk and didn’t stir it so it was really just the thick stuff. The pie was fantastic. Better than the non-vegan version! This was wonderful! My omnivore family enjoyed it and so did my vegan husband and I. It tasted just like, if not better than, pumpkin pie from the grocery store bakeries. Happy Thanksgiving! I am from Holland and here we have no pumpkin pie spice (or canned pumpkin puree). What is in pumpkin pie spice? I assume I can mix the spices myself? Thanks for helping Monique out helena 🙂 I hope you both enjoy the pumpkin pies! We had this for desert for breakfast and I have to say… IT’S AMAZING! The filling came out dark, so at first I thought I did something wrong. I let it set set in the fridge overnight and hoped for the best. My roommate isn’t vegan and said they love it! I will definitely be making this again! It’s so easy to make, too. Making this pie for Thanksgiving and so far ir tastes amazing! Just a quick question. For Christmas I want to make a cheesecake pumpkin pie, if vegan cream cheese was mixed in to the pie batter, should it cook all the same? I think that would be a very different recipe, and without recipe testing it myself, I wouldn’t want to recommend trying anything in case it doesn’t work out. Sorry I couldn’t be more help! Great recipe, I’m not vegan but I have a family member who doesn’t do dairy or soy, so regular recipes or anything store made were out and came across this, super easy to make, paired it with a graham cracker curst and it taste just like a regular pumpkin pie, which I think is the highest compliment I could pay, you could serve this to anyone and they would be non the wiser. Mine’s in the oven right now, but I’m a little worried. Yours looks thick and you mentioned spreading it. Mine was much thinner, just a thick liquid really. I followed the recipe exactly. My coconut milk was shaken well and nice and thick. Should I be concerned? I don’t think so, just make sure the edges are cracked and the center still looks a little wobbly when you take it out of the oven. Enjoy! Thank you for this awesome recipe! I’ve been meaning to update you after my concern. It came out PERFECT! Best pumpkin pie ever. I tried making this tonight and with 14 minutes left to go, I checked on it and it was really dark brown. It was still pretty runny inside I think but I freaked out so I took it out. It looks like it’s solidified now that it’s out, but do you know what could have gone wrong? It’s possible that your pumpkin was just a little darker than mine. Nothing major to worry about, as long as it is cooked enough it should be just delicious. This pie is in the oven now. The batter is so yummy. So far the batter is the best tasting vegan pumpkin pie I’ve ever had. I used organic blue agave because it’s all I had. Also didn’t have pumpkin pie spice so I used ground allspice and ground ginger in its place. Thank you for posting this great recipe!! Was just coming here to say the same thing about the batter – I couldn’t stop eating it! Can’t wait to try the pie tomorrow (with some yummy coconut whip)! Yes, agave should be just fine. Apple pie spice should work, if you have extra nutmeg, I would add a bit more of that in as I think it has less nutmeg than pumpkin pie spice. Enjoy! How much pumpkin pie spice extract can I use to replace the powder form of the pumpkin spice? I’ve never baked with pumpkin pie spice extract before, so I would say, depending on how strong it is 1 to 2 teaspoons. I was wondering what you would recomend as a substitute for maple syrup. Maple syrup is difficult to find and expensive where I live. I have corn syrup, would corn syrup work? Nevermind, i see you answered this for someone else. Corn syrup would work just fine. Enjoy! I will be making this very soon! Would agave syrup be a reasonable sub for the maple syrup? We do not like any “maple-y” taste. Do you taste the maple? Thank you! Yes, agave should work fine, and so would corn syrup. Enjoy! Hi! I just baked a double batch of this pie and if the pie is as delicious as the batter, everyone is in for a yummy Thanksgiving treat! They look divine!!! Since I made the pies two days early, what is the best way to store the pies? In the fridge? Covered or uncovered? Thank you for an amazing easy recipe. Just what I was searching for! Yay! So happy to hear that. I would keep them covered in the fridge. You can remove them a few hours early before serving if you prefer room temperature pie. I hope you love them! Thank you so much for this delicious recipe! This is my first Thanksgiving being vegan and with none of my family members being vegan, I am in charge of bringing the vegan dishes. I did a test run pumpkin pie with another recipe… and it turned out a little curdled. So, I tried this one and it was phenomenal! Thanks again for this delicious vegan recipe! Oh yay! Too bad the first recipe you tried didn’t work out but so happy this one did for you! The last thing you want is a curdled pie! Ew! hahaha. Have a happy vegan thanksgiving!! This pie sounds perfect and I’m planning on making it this Thanksgiving. I was curious if need to use full fat coconut milk or if I could use lite instead. Also, will it be the same without brown sugar? Just curious. Thanks! Hi Zoe, you want to use full-fat coconut milk so that the pie is rich and creamy. The brown sugar makes it sweet and holds moisture, so no it would not be the same without. Enjoy! Hi Sam your recipe looks amazing and thank you very much for sharing. I am making this pie for friends who have dairy and egg allergies. So this recipe is ideal. I have extra thick coconut milk do you think this would work? Hi! !- I went to the store and forgot to buy coconut milk. I have lactaid milk and coconut cream. Can I use a combo as an alternative?! I would just thin out the coconut cream with a bit of water until it reaches a thick heavy cream consistency. Hope that helps! Wow. I made this to bring to my mother-in-law’s house today where there were over ten people (none of whom are even close to being vegan). They all LOVED the pumpkin pie. This is an amazing recipe. Going to make it again on Saturday to take to my grandma’s house. I love that story! So happy your boys could enjoy the pie! I made this pie and I absolutely loved it! I was just curious about one step to make sure I am doing everything right because i feel like my mix did not fill my pie crust as much as yours. When i opened my can of coconut milk there were some solid parts and some runny liquid parts. When I measured it out it was mostly liquid and some chunks of the thick part. Did you only put the thick part when you measured or was it the liquid? Shake the can vigorously before opening and measuring the coconut milk. This will mix the solid and liquid. It’s possible that I just had a slightly smaller pie plate than you so it would fill more. Enjoy! I followed the recipe exact, and put it in the fridge to sit overnight after letting it cool. It came out of the oven really dark (darker than your photo above) and is actually a little “too” much set; like too jiggly. The taste is spot on, but wondering what slight adjustment you may recommend? Shorter bake time? Less corn starch? I like at about 2500 ft elevation, if that has anything to do with it. I don’t know much about high elevation baking, but I do know that evaporation happens quicker. My guess is that the pie lost more moisture than when I bake it at my elevation, which would make it darker, and firmer. I would try adding more coconut milk to up the moisture. Hope that helps! All of my family said this is the best vegan pumpkin pie recipe I’ve ever made. Glad I found this recipe. I’ll make that adjustment for thanksgiving. You can freeze the pie crust, and the uncooked filling separately. Then thaw, pour the filling into the crust, and bake as normal. Alternatively the pie can be made up to 2 days ahead of time. Hope that helps! Does the pie have a distinct coconut flavor? Can’t wait to make this! Made this without any crust and it was delicious! Going to make it with graham cracker crust for Thanksgiving. Thanks for posting Sam! So to make it crustless I just pour the filling in just a pan and it should turn out the same? Yep! It might take a little less longer to bake, so keep an eye on it and when it has cracks around the edges but the center is still a bit wobbly, it’s ready to take out. Enjoy! I was wondering if I could substitute the cornstarch for arrowroot? Thank you! I am so excited to try this tonight! Yes, it should work just fine. Enjoy! Would arrowroot be the same measurement as cornstarch? I haven’t tested it myself, but that’s what I would try. I hope it works for you! Great pie. Tried it this week and will definitely make for Thanksgiving. Forgot to put in the salt but it was fine without it. I am wondering if this pie could be frozen to bake later? I would freeze there filling, and the crust separately. Then when you want to bake, thaw them both, fill the crust, and bake as normal! That should work just fine. Hope that helps! Enjoy! I was wondering if you use sweetened or unsweetened coconut milk? Thank you! Just regular full-fat coconut milk, the kind in the can not in a carton, such as this. (I don’t believe it comes in a sweetened variety). This looks delicious. I like the idea that it is creamy. I’ll have to try it. Thanks for sharing. What do you think about substituting silken tofu for the coconut milk? I just made this today and it was amazing!!!!! Tastes SOO good. My crust turned out perfectly as well as i used the one reccomended by this recipe. Pairs greatly with coconut whipped cream. Woot woot! Thrilled you love it Rosina! Hi there! So i’m attempting this recipe tonight and i’m just wondering what sort of consistency the coconut milk should be when you first get it? The one i got is very liquid-y but i know some come looking a bit more solid. The liquid one you have is the right stuff. The more solid ones are usually called coconut cream or premium coconut milk. Enjoy! Hi Sam, about to attempt this recipe. Can I ask what size pie dish you use? Oh yes, duh! I should have that in the post. A standard 9″ pie dish. Enjoy! Another amazing recipe from the lovely Sam! I finished making this last night for my family and I and allowed it to set over night (which was difficult to control my insatiable sweet tooth by the way). Both my Mom and Jack loved it and he even touted it the bet pumpkin pie he’s ever had (and he’s 63). 🙂 Thank you! P.S. I didn’t have coconut milk so I ended up trying and praying that the coconut yogurt on hand worked just as well. It delivered! I’m going to make this for my company harvest and I’m wondering what allergens to mark. The pumpkin pie filling is gluten free, but the pie crust is not. You could always purchase or make a vegan and gluten free pie crust if you want it to be suitable for everyone. Hope that helps! Okay great, I read through these comments and I picked up a VGF graham cracker pie crust. I’m going to make this tonight and I’ve got high hopes. I made this for thanksgiving because I’m currently off of dairy and eggs for my sensitive breastfed baby’s sake, and off of gluten and corn for my sake. I substituted arrowroot starch for the corn starch, as you suggested in the reply to a comment, but other than that I followed the recipe pretty much exactly. It was INCREDIBLE!!! The texture was thick and creamy and the flavour was rich and totally on point! Thank you so much for helping me make the best part of thanksgiving!!! I’ll definitely be making this again soon. For some reason the site isn’t allowing me to rate the recipe, but I totally give it 5 stars! This pumpkin pie was amazing. I’d give it 10 stars. 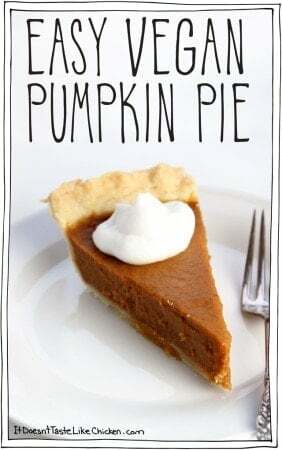 Omnis and vegans alike ate it and proclaimed it their favourite pumpkin pie ever. I used a gingerbread cookie crust (similar to graham cracker crust, but could not find vegan grahams). Don’t hesitate! You will love it. Thank you so much Pamela!! Thrilled that you love it. The gingerbread cookie crust sounds amazing! I baked this pie yesterday!!!! Yummy! Only thing I added was crushed pecans on the top and a decorative circle of candy corns in the center! Good job in your recipe. I’m going to look up your blog! Best pumpkin pie ever! And easiest! Thank you! I love how easy it is. Even for a first time pie baker I got it right on the first attempt. When all my guests learned that it was vegan they couldn’t believe it! i love how this recipe uses simple ingredients too, nothing weird! This pie is the BEST most delicious pie I have ever had. My four children are begging me to simply quarter the pie for them and just let the adults have coffee ! Thank you for this new holiday staple and congratulations on your book–you deserve wonderful success. This pie is perfection! I can’t wait to make it again for my family when Thanksgiving comes. They’ll be shocked it’s vegan! Honestly, one of the best pumpkin pies I’ve ever had. I used Trader Joe’s canned coconut cream. Phenomenal. Mother trucker! I didn’t notice your filling was pourable. I lost the canned pumpkin lottery and got one of the random drier cans. Now the filling in my pie and tarts (had to make a second batch of filling as my pie plates are DEEP) looks set and the crust isn’t done. Going on 30 min for the tarts =( Fingers crossed. In the end, all is good. The pie just ended up taking about 80 minutes, the tarts, about 40. I feel I need to check my oven calibration. My baker brain also has to remember that there are no milk solids in the crust, which greatly decreases browning. The pie tester, however, is quite happy, and tells me you would never know it’s a vegan pie. SO, thank you! Used both your recipes, the vegan crust and the pumpkin pie one today for the first time for our Canadian Thanksgiving! I doubled your recipes so I could make two. The smell is so tantalizing coming from my oven right now!!!! I had never tried making my own crust before and I am THRILLED with how easy it was! Thank you sooooooo much for the tip about the towel down first, really made transferring to the pie plate simple!! Thanks for the recipe, I’m planning on making something vegan for thanksgiving, but do you have any idea how these would turn out as mini pumpkin pie tarts instead of a pie? Using a pie crust, just baked in a normal sized cupcake pan. How long do you think they should cook for? How far ahead can this dish be cooked and then refrigerated? This is a great addition for Thanksgiving! Yes, they would absolutely work as tarts. I would try baking them for about 15 to 17 minutes. The tart shells should be golden and the filling should look set. You can make them the day before. Enjoy! Thanks so much; I am going to make this next weekend! Do you think a graham cracker crust would work too, or would it burn with such a long cooking time? My son is allergic to all things coconut. Is there another option? Would non-dairy milk work? Non-dairy milk should work fine, as long as it is rich and creamy. The coconut milk is high in fat which provides a nice creaminess, so opt for a high fat non-dairy milk such as soy. Hope that helps! I love this recipe… I really want to make it! Quick question… is this a similar texture to a typical non vegan pie? If not how is it different? I am making a cooking video for a school project, and I want to show everyone how good a pumpkin pie could be vegan! If you are posting this video online, my recipes are copyrighted, so please make sure to not post the full recipe, and instead share a link directing readers to my site for the full recipe. Enjoy! Thank you! I’m actually just sending online through my online course directly to my teacher. So only she will ever see it and I will be sure to source any websites I use in my project. Hi I was just wondering how long you think the pie would be good for and if I can freeze it? Thanks! Awesome recipe. The longer the pie sits, the more moisture the crust will absorb and the less flaky it will get. I would recommend making it no more than 2 days ahead of time, the day before is the best. You can make the pie crust about a week in advance and just wrap the ball of dough in plastic wrap and store in the fridge until ready to use. The filling really only takes 5 mins to whip up. I have never tested freezing the pie myself, but I have heard that it can turn out not so great, so I wouldn’t recommend it. Hope that helps! Hey, do you have to use pie crust? I’m vegan and can’t find vegan pie crust anywhere. Just asking if it’ll make a difference to the flavour! You can make my Easy Vegan Pie Crust recipe if you like. Otherwise, you could make it a crustless pie. It won’t effect the flavour of the pumpkin. Hope that helps! I noticed in the comments someone mentioned that the coconut milk cannot be tasted in the pie, however, is there something you can use to substitute for coconut milk? I like coconut milk because it is rich and creamy. You should be able to substitute it with another creamy milk such as cashew milk and it should turn out ok. Hope that helps! Tapioca starch provides a very different texture than cornstarch, I use it in vegan cheese recipes because it is stretchy and gooey. My guess is that it would mess with the texture of the pie. If you are looking to sub cornstarch, I think arrowroot would be a closer sub. Hope that helps! The recipe was perfect. It set in about 90 and and about 60 minutes in the fridge. and I couldn’t eat it fast enough. It was amazing. Thanks. Hi.. sounds and looks yummy! before I attempt to make it… I don’t like buying canned stuff and got many pumpkins from the garden. should I make a natural puree or do i have to cook it? thanks sam! Fresh pumpkin! Yum! Canned pumpkin is cooked, so it would be best if you cooked your puree first. You could roast the pumpkin in the oven then scoop out the flesh once cooked, and that will work great! Enjoy! “Everyone’s mouth exploded with compliments! !” I love that!!! I mean can we really ask for more!? We can’t. So very happy you love the pumpkin pie recipe so much, thanks for coming back and letting me know, it totally made my day! Hey Sam, I tried the pumpkin pie and it was completly delicious!! the filling is so creamy and i love the coconut in there. I had to improvise with the spices a bit since I couldn’t find the pumpkin spice mix in switzerland. but it really turned out great! I also used your pie crust recipie and the texture was fluffy, crumbly, melty, buttery (though vegan) and perfect! so good! It turned out so good! My 1st pumpkin pie. I accidentally used the whole can of coconut milk and it still came out fine! Next time I’ll attempt the homemade crust! I’m thinking about making this pie, but I’m a little worried about not pre-baking the crust. What’s the reasoning behind not pre-baking it? Looks great, but which spices are in “pumpkin pie spice? I don’t have it in my supermarket. You can make your own pumpkin pie spice at home, the recipes vary but any of them would work just fine. Here is a good looking recipe. Enjoy! Currently enjoying slice #2 of this delectable pie! It’s somehow even better on the second day. My auntie wanted to make a vegan pie for Thanksgiving this year so I’d be able to enjoy dessert (so sweet!) and she picked this recipe. It set up perfectly and is so creamy and perfectly spiced. I absolutely love the use of the rich coconut milk! For those who don’t like coconut, you can’t taste it at all but I’m sure it lends to the luscious texture. This’ll definitely be my new go-to pumpkin pie recipe. Made this for a vegan Thanksgiving dessert option – YUM!!! I did reduce the brown sugar by half but that was the only change. It makes a good breakfast option too! Yay! So happy you loved the recipe Angie. Pie for breakfast = amazing! I’m going to try throwing my filling in a blender next time. In my recipe I always heat the coconut milk and cornstarch so it thickens but the blender definitely saves time. Love it! Haha! I like it, I am going to go ahead and say it’s a word. No, you can’t taste the coconut, the pumpkin and spices take over the flavour. The coconut milk just adds a rich creaminess. Enjoy! Looks great! Now what about a recipe for the vegan whipped cream on top?! It’s my recipe for Coconut Whipped Cream 🙂 It’s an old post that need updating, so sorry for the bad photos, but the recipe is still the same. Enjoy! I think substituting maple syrup with agave will work just fine (no need for the molasses). If you worried about missing the slight maple flavour you could add a drop of maple extract, but I wouldn’t worry about it. Enjoy! Sam, this looks great! I found a vegan pumpkin pie recipe that I was going to try but it looks like a fussy recipe and I’m not super excited. This recipe looks wonderful! Glad to see a pie crust recipe too. I always bought the pre made kind. I’m pretty bad at making it and feel intimidated for some reason, but will try this year. Quick question, the coconut milk is the kind in a can right? Or the kind in a half gallon carton? I’m so excited to try this! Would lite coconut milk produce the same results? It would still work as far as making a pie goes, but it wouldn’t be as rich or creamy. Thanks for this! I’ve been looking for a vegan pumpkin pie (I’ve been doing flax meal subbed for eggs (great) but still with the evaporated milk (not so vegan)), and I need to go full vegan for Thanksgiving because of my awesome niece (I’m largely but not strictly vegan, but I ended up with a vegetarian niece and a vegan niece, how proud an aunt am I!) I trust your taste (you know how sometimes people are like, “This is delicious!” and you try it and you’re like, “Um, are you flavor-blind?”) so I feel confident about the results of this, AND an easy recipe is for the win! Definitely going to give this one a try. I cannot wait to make this! Thank you! This pie looks absolutely perfect!! And super duper creamy, which is always the best pie!